Hillary Clinton’s team is trying to blame Former Secretary of State Colin Powell for her use of a private email server, Powell said on Saturday in East Hampton, New York. “Her people have been trying to pin it on me,” Powell told People at the Apollo in the Hamptons 2016 Night of Legends event. “The truth is, she was using [the private email server] for a year before I sent her a memo telling her what I did,” he added. Powell’s comments come after it was revealed in notes from a report given to Congress last week that Clinton told the FBI in an interview that Powell had advised her to use a personal email account while she served in the State Department. The claims are also being made in an upcoming book by journalist Joe Conason, “Man of the World: The Further Endeavors of Bill Clinton,” in which he details a 2009 dinner party attended by Powell as well as other former secretaries of state Condoleezza Rice, Henry Kissinger, and Madeleine Albright. The book says that at the dinner, the former secretaries of state gave Clinton advice, and during dessert, Powell recommended to the Democratic nominee that she should use a private email account while in office. Clinton told Powell that she had already planned to continue using the private server set up in the basement of her home, which she had used while she ran for president in 2008, according to the book. After the revelations, Powell said in a statement on Friday he had no “recollection” of the dinner conversation described in the book. 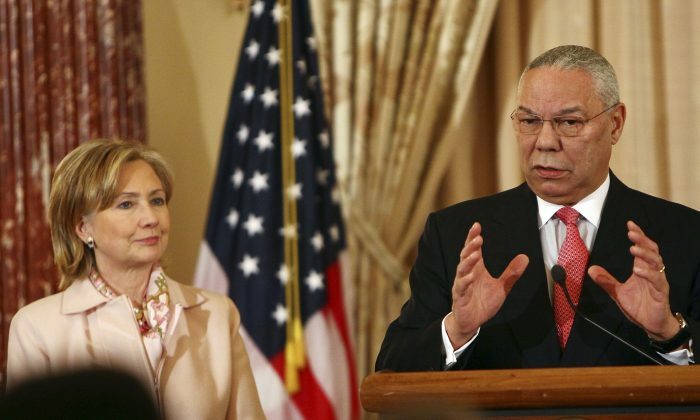 However, Powell said he did send the Democratic nominee a memo detailing his use of a personal AOL email account shortly after she took the role of secretary of state in 2009. Powell, who was secretary of state when George W. Bush was president, said he told Clinton that his use of a personal account “vastly improved” communications within the department, which back then did not have an equivalent internal system. He also clarified that he used his personal email account only for unclassified messages. Powell said the FBI may have gotten hold of a copy of his memo to Clinton in their investigation of her use of a private email server.